What do you ask of God's Church for your child? You have asked to have your child baptized. In doing so you are accepting the responsibility of training your child in the practice of the faith. It will be your duty to bring your child up to keep God's commandments as Christ taught us, by loving God and our neighbor. Do you clearly understand what you are undertaking? Baptism is the first sacrament of initiation and is a joy filled occasion! We are grateful you are planning to have your child(ren) or yourself baptized. Through the waters of baptism, original sin is cleansed and our spirit is renewed in the Holy Spirit. It is through baptism we truly become the sons and daughters of God, the brothers and sisters of Jesus, and family to each other in the Church community. Parents seeking baptism for their child, infant through age 7, are invited to contact the office to arrange for Baptism class so they can confidently answer we do to the question above. Those over Age 7 can attend the RCIC/RCIA program as they have reached the age of reason; RCIC/RCIA information. Sunday is the recommended day for baptism preferably during the celebration of the Mass with your fellow parishioners. Please fill out the form with you and your child’s information. 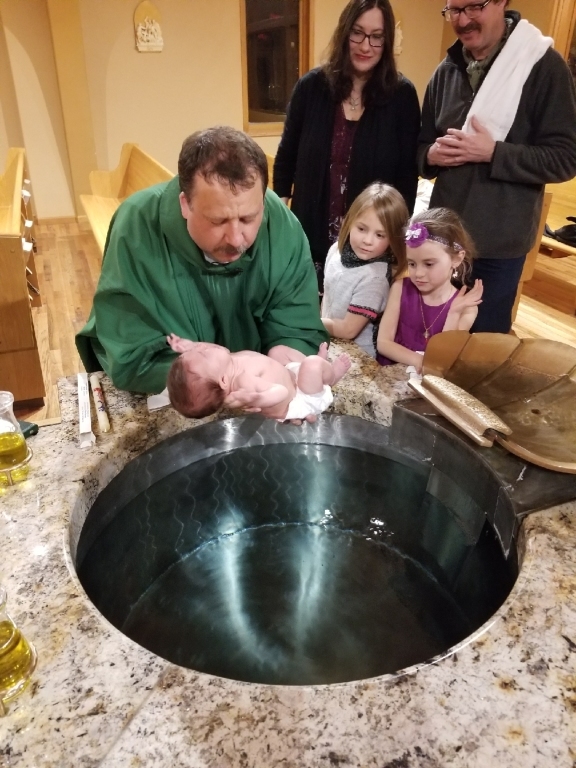 Baptism can only be scheduled through the Church office or with Fr. Andrzej. Godparents who regularly attend Mass outside of Our Lady of the Black Hills will need to have an affidavit of good standing filled out by the priest of their home parish. A sample is below. You must have one male and one female sponsor. Sponsors must be at least 16 years of age, be Confirmed, and be active in their Catholic Faith. At least one of the sponsors must be a practicing Catholic. If the person is not Catholic, they can act as a Christian Witness for the Baptism as long as they are an active member of a non-Cahtolic Church. Sponsors may not be the father or mother of the person to be baptized.